I've written a small addon for Thaumcraft 4 for the purpose of debugging and/or cheating. It adds a single command. Type "/alltheresearch" into the chat to give yourself 999 research points in every aspect in the game. The command is only available if you have cheats enabled for that world or are a server op. It's a nice middle ground if you don't want to scrounge around for research points, but still want to play the research minigame. Or, if you want to bypass some research, but still want to discover some others, instead of just unlocking everything with the Cheat Sheet. You can download the mod from mediafire here. To install it, just place the file in your mods/ folder. This mod obviously requires Thaumcraft 4 in order to work, which obviously requires Forge. 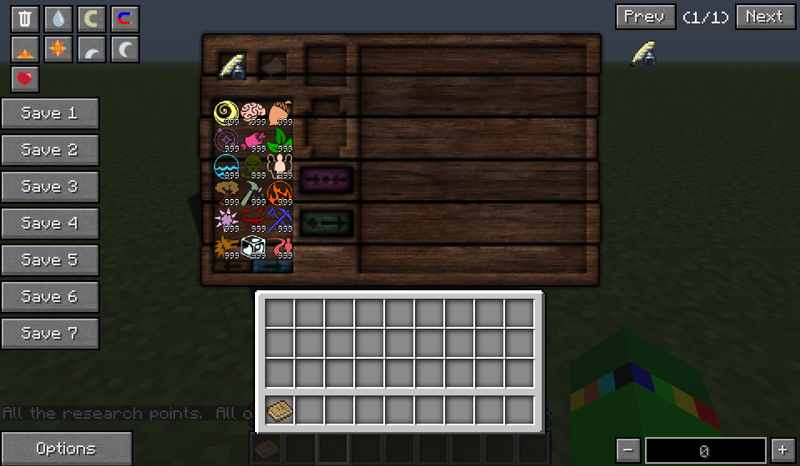 The mod must be installed in the server's mods folder in order to work in SMP. Azanor, for writing one of my all-time favorite mods. This mod inspired by Succubism's efforts to update this guide. YA SHOULDA BEEN THERE WHEN ALL MY RESEARCH GOT RESET. Ah well. Will probably use this anyway. Nine hundred and ninety nine research points and I still don't feel like i'm done son! (felt rhymey) But awesome sauce this is a rather useful mod, wont lie I'm kinda addicted to the research minigame. any plans for a command that unlocks all the research aswell? I know there's the cheat sheet, but with the cheat sheet the new research that gets added is automatically unocked. but if there would be a command to unlock all the current research, you could still research any new research (phew, research.) this would be helpful for people who lose their research because of a bug or a crash. well if your going to have cheat enabled for all this might as well enable the cheat sheet and cheat it in and you got all the research done and you have full research points. Did you read the part that he said "It's a nice middle ground if you don't want to scrounge around for research points, but still want to play the research minigame." ? Can you maybe offer an option in a config file to just give infinite primal aspects? That way its not AS cheaty since you still have to take the time to make the primal's into the more advanced ones. Also like others said, an option to select how many of each aspect is added. Gonna wait on TC 4.1 before I update this mod. Not much point in adding features that may not end up working. Walp. Looks like 4.1 Thaumcraft adds admin commands for adding research points, so this mod is just redundant now. I hope you all had fun with it while it lasted. I would still say it is far from useless, at the minimum it is way more convenient than typing /tc aspect for every single aspect, unless I've missed some way to do it for all. I don't suppose you could release the source code? I'm interested in knowing how you got the list of aspects (assuming it wasn't hard-coded) and how you gave the player a certain amount of them. My current location: Third planet, Sol system, Gould Belt, Orion Arm, Milky Way galaxy, Virgo Supercluster, Pisces-Cetus Supercluster Complex. And yes, I'm a geek. As if you couldn't tell. Yeah, after playing around with TC's new command for a bit, there definitely still seems to be a need for a command that'll give you all aspects at once. I'll look at maybe updating this mod to work with the new research system and actually let you specify a point amount. I could probably release the source to this, yeah. No promises on when. This mod is EXACTLY what I was looking for! I have no plans to update this mod to 1.7.2. Oh praise you oh mighty one...how I SHUN starting Thaumcraft in a new world...SCANNING EVERYTHING. Oh you are majestic. Are you sure this mod will not be updated to 1.7.2 ? This thread has been locked by request of SpitefulFox as he does not want to update this mod anymore.